No matter how you style your hair, there will be maintance. When it comes to natural hair, this is especially important because of our texture. The winter brings forth cold, dry weather that wreaks havoc on our hair which is why protective styles are popular during this time. However, protective styles still need protection overnight and different styles, textures and lengths can require different methods of preservation. There are different factors when it comes to preserving your style overnight. What is the length of your hair? What is your hair type? Are you preserving a twist-out, perm rod set, or a bantu-knot out? These types of questions can help you make better decisions about which products, tools, and methods to use. In my experience, the length of my hair is a huge factor in how I protect my hair at night. When I had a chin length curly bob with bangs, a single pineapple stretched out the the majority of my hair leaving my curls flat at the root. My solution was to create 3 to 4 mini pineapples to keep my curls from stretching. Then I would use a satin bonnet to protect them from my tossing and turning. This same solution worked well when I needed to preserve a perm-rod set on that same length hair. However, with my current hair length past my shoulders, a single pineapple works just fine. Furthermore, understand that what works for me may not work for you. The reason being that we may use different hair products or have different texture types. Have you ever noticed that the bomb twist-out your favorite blogger does, never looks the same on you? You may have completely different hair types. Type 2 hair will not have the same results from the same methods as Type 3 or 4 hair and vice-versa. The different hair textures also require completely different products. I’ve learned to accept that the twist-outs in my combo 3C/3B hair are never quite as fluffy as my sisters with Type 4 hair. Taking into consideration that hair length and textures can bring different results, here are a few of my favorite ways. Multi-pineapple (parting hair into 4 sections) followed by an oversized bonnet works great, especially on shorter-lengthed hair. A silk scarf wrapped from underneath, tied in the front that leaves hair in a loose, unsecured pineapple. A satin bonnet on a perm rod set which works well if the hair is too short to place into a multi-pineapple. Old pantyhose work by cutting one side of your nylons around the ankle or higher and again at the toe, applying it like a headband. Roll out the material until your hair sticks straight up. If you have thicker hair or a larger head, use the section from the waistband to the crotch and cut just below. Additionally, cut a hole in the crotch so that your head goes all the way through. Re-twist or re-braid your old twist-out to maintain a similar style. You can also pin your new twists across your head to stretch and add length. 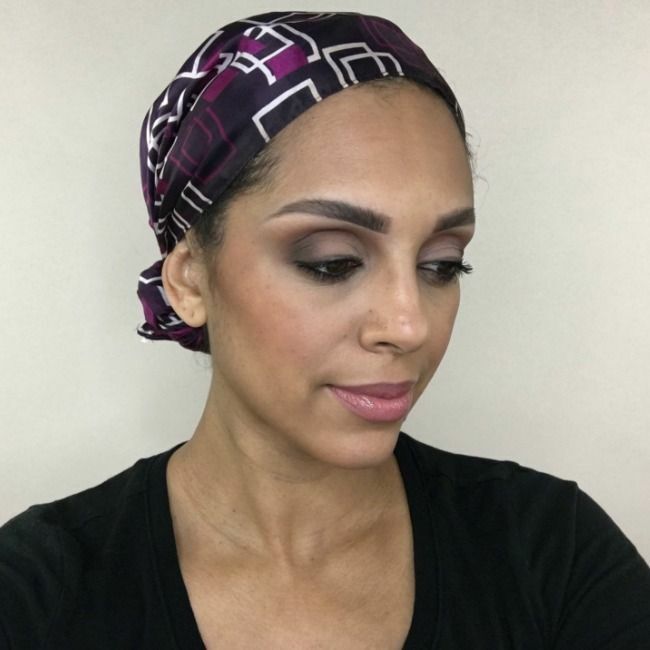 Follow up with a satin scarf to cover all exposing hair. What are some of your favorite ways to preserve your hairstyles at night?